Diana Gabaldon’s brilliant storytelling has captivated millions of readers in her bestselling and award-winning Outlander saga. Now, in her first-ever graphic novel, Gabaldon gives readers a fresh look at the events of the original Outlander: Jamie Fraser’s side of the story, gorgeously rendered by artist Hoang Nguyen. And then there is Claire Randall—mysterious, beautiful, and strong-willed, who appears in Jamie’s life to stir his compassion . . . and arouse his desire. But even as Jamie’s heart draws him to Claire, Murtagh is certain she’s been sent by the Old Ones, and Captain Randall accuses her of being a spy. Claire clearly has something to hide, though Jamie can’t believe she could pose him any danger. Still, he knows she is torn between two choices—a life with him, and whatever it is that draws her thoughts so often elsewhere. 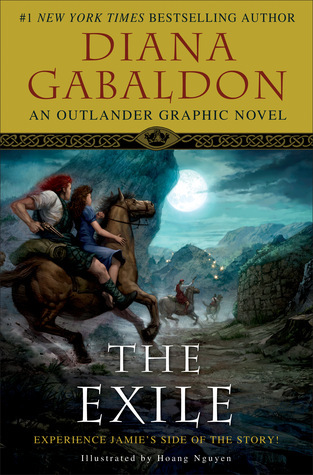 Step into the captivating, passionate, and suspenseful world of The Exile, and experience the storytelling magic of Diana Gabaldon as never before. You may need a toothpick for this one. It’s Outlander bite-sized. Unlike my 20th anniversary edition of 627 pages of the first novel, this graphic novel comes micro sized, fast paced, only highlighting the most important events in the briefest of ways. From the time Jamie finds Claire you will follow the abbreviated version of the book till it renders to its end where Claire tells Jamie the truth and tries to return to her time. And we all know what happens…. This is not where the actual book ends and I have to research if there are plans to continue with more graphic novels. Overall, I enjoyed this little delightful visual piece, but there was sooo much more content that happened in-between that this version simply cannot show or pack in. As a matter of fact, I think if I would not know the details through reading the novel first and watching the show, I am not sure if I’d understood all the reasoning and the pace of this graphic novel. It simply left out the cohesive bond and details needed to round it out and make it flow. However, if you are just looking for a little something-something in between other reading or you are curious….it sure makes for a delish little bite in between. And I had it for breakfast!